In this Dec. 1, 2017, file photo, Sen. John McCain, R-Ariz., leaves a closed-door session on Capitol Hill in Washington. 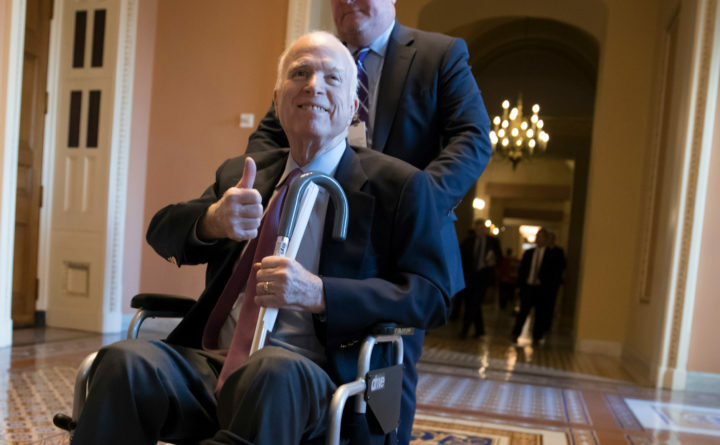 McCain's office said Monday, April 16, 2018, he is in stable condition at a Phoenix hospital after intestinal surgery needed to stem an infection. Sen. John McCain, R-Arizona, who has been home in Arizona battling brain cancer, underwent surgery because of an intestinal infection, his office announced Monday evening. McCain, 81, is in “stable condition,” the statement said, after the surgery at Phoenix, Arizona’s Mayo Clinic. The infection was related to diverticulitis, which is caused by pouches forming in the wall of the colon. Doctors at the Mayo Clinic diagnosed McCain in July with glioblastoma, an aggressive form of brain cancer that took the lives of Sen. Edward Kennedy, D-Massachusetts, and Beau Biden, son of former Vice President Joe Biden. If McCain were to resign before the end of May, Gov. Doug Ducey, R, would appoint an interim senator and there would be a special election in November. If the vacancy occurred after that point, Ducey’s appointment would serve through the 2020 elections.